Built an outdoor synthetic turf futsal court for Kolej Matrikulasi, Melaka (January 2008). 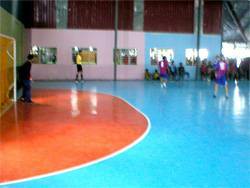 Installed an indoor synthetic turf futsal court in Tanah Merah, Kelantan (February 2008). Installed a children's rubberized floor in Perlis (February 2008). Repaired netting and turf for burnt futsal court in Perak (February 2008). 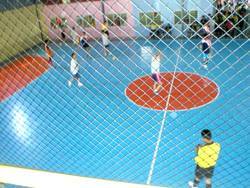 Installed 1 big and 1 small futsal Olymflex Seamless Fibre-Reinforced PU Membrane System Rubberized courts in Perlis (March 2008). 1 big Olymflex rubberized floor futsal court for Perlis. Another view of the Olymflex rubberized floor.